Vermont is a very special and beloved place for me and my family (as of today, you’ll find no fewer than 50 posts here about everything from maple creemees to mountains). Tropical Storm Irene devastated Vermont this past weekend, flooding many of the communities and businesses I’ve visited and enjoyed for the past 30 years. I know that the impacts of this storm are going to be long lasting but I also know that Vermont is a resilient and beautiful place full of people who believe in community and helping each other through tough times. I wish I could be there to help clean up, but since I can’t I’m going to do what bloggers do best: Write posts this week to let you know that Vermont is still open for business! As soon as the roads in Vermont are open (and more of them are being repaired each day) I urge each and every one of you to consider planning a fall or winter trip to Vermont to see this amazing place and help rebuild its economy. And if you’re looking for ways to offer help immediately, here’s a list of ways you can do so. 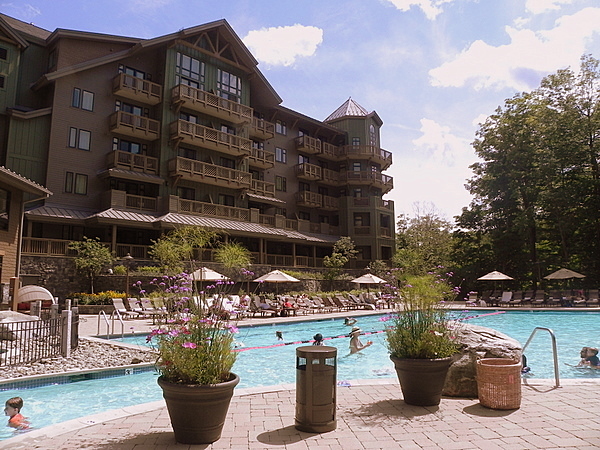 I start my series of Visit Vermont posts today with a review of Stowe Mountain Lodge, where we enjoyed a lovely weekend in the middle of August. The resort was not badly affected by the storm and is open for business – as is the road that leads to it. 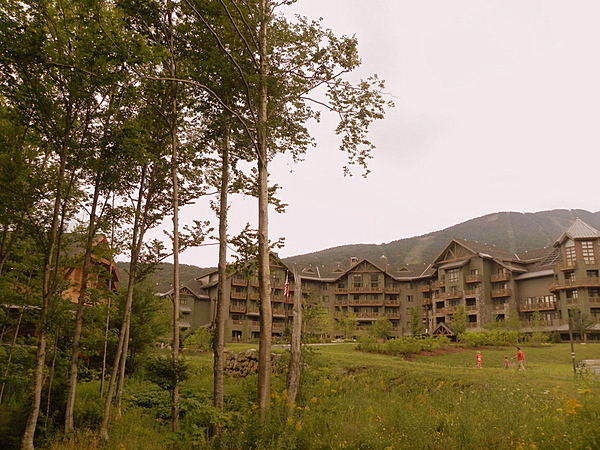 You’ll find Stowe Mountain Lodge about seven miles up the Mountain Road outside of Stowe Village, right at the base of Mount Mansfield, the highest mountain in Vermont. The best word to describe the resort is gorgeous. 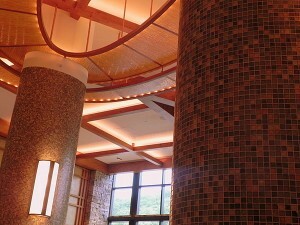 Designed in the Adirondack style the building has high ceilings, beams, native stone, and windows throughout. 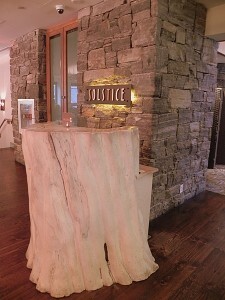 Materials were locally sourced as much as possible, right down to the maple tree that serves as a host station at the restaurant (it came from the property when it was cleared to build the hotel). 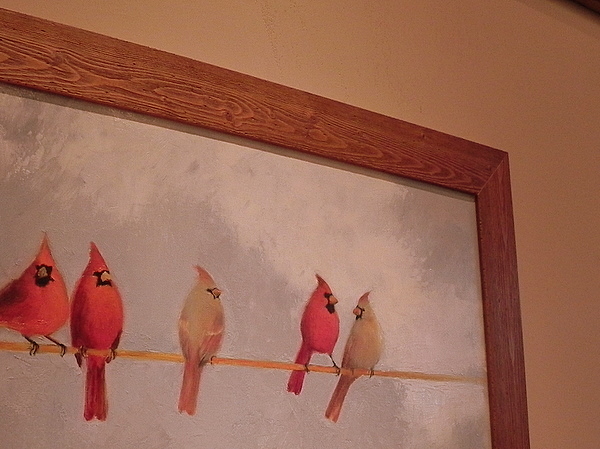 The public spaces of the hotel are comfortable, inviting, and carefully decorated with work by Vermont artists. I’ve never seen a more perfectly appointed hotel-room kitchen than this one. How they fit so much into such a small space is a major feat of engineering, but in a narrow galley we had a gas stove top, sink, dishwasher, microwave, refrigerator, toaster, blender, and coffee maker. There were also pots and pans and more ceramic dishware from Simon Pearce that made sipping morning coffee an elegant pleasure. I could easily imagine making breakfasts and simple dinners here if were visiting on a ski vacation. One more nice touch: Our studio actually had an entryway that it shared with the adjoining studio, with a locking door that led to the hallway. This can be used to stow gear (especially handy in the winter I imagine) and would work really well for a larger family or two families who wanted to vacation together. The Lodge offers studios like ours, one-bedroom suites, larger suites with multiple bedrooms and bigger kitchens, and some basic hotel rooms that don’t have kitchens. 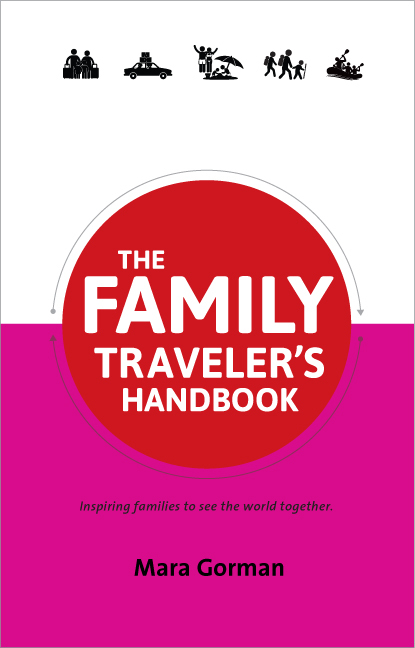 Within each category of room there are variations not only in view but in layout, so if you really want to know exactly what you are getting it might be better to call for a reservation; the call-center staff is intimately familiar with the layout of the hotel and can help you make a choice that best suits your family’s needs. Note, however, you can often find the best deals for rooms online. 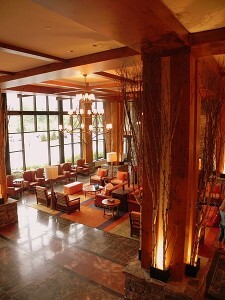 I’ve never enjoyed eating in a large hotel as much as I did at Stowe Mountain Lodge. We ate all of our meals in the hotel during our stay and the food was almost without fail creatively prepared, fresh, and delicious. I was especially impressed with how well the chef Cody Vasek composed dishes, combining flavors and textures to great effect. 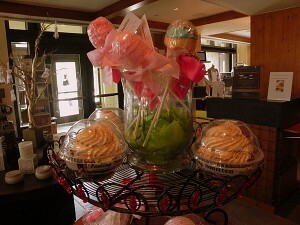 Local ingredients are featured throughout. 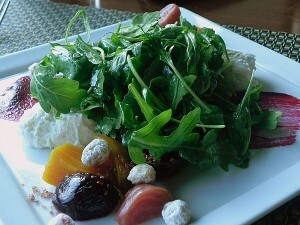 Among my favorites were the beet salad with goat cheese, greens, and hazelnuts. 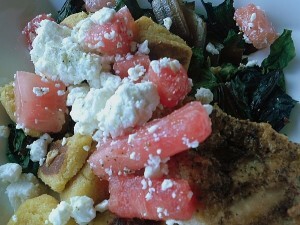 I also loved the crispy chicken breast with swiss chard, cornmeal gnocchi, watermelon, and feta. As far as the kids were concerned, the “growing youngsters” menu contains some of the things we’ve all come to expect from children’s menus like sliders and chicken fingers, with the difference being that when the food arrives it is identifiable as actual food and has carefully been prepared to order from scratch. And not everything is as you might expect it to be (and I mean that in a good way); for example, the macaroni and cheese is made with multigrain pasta and a béchamel sauce that any adult would happily dig into. Tommy loved the grilled halibut which came with lovely local carrots and fabulous hand-cut French fries. There are also some fun touches that my kids really liked. The smoothie of the day was a definite hit – ours was pineapple-coconut and tasted just like the very best virgin piña colada. 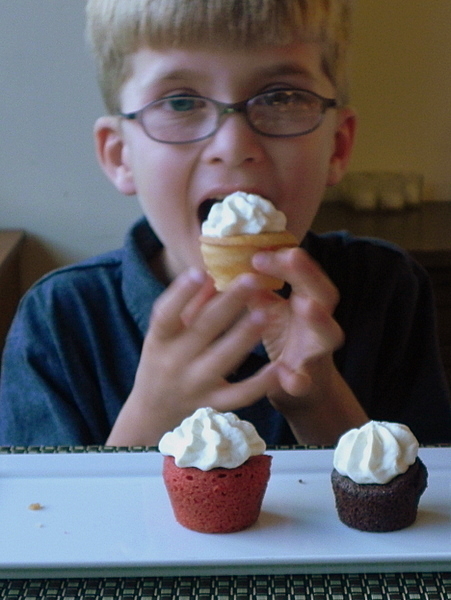 And the desserts are fun and kid-sized, like three mini cupcakes. As with every other aspect of the hotel, the atmosphere in the dining areas is elegant but informal with attentive service. We ate in both the bar area and in the main (and more formal) Solstice Restaurant and felt completely comfortable having the children in both. On weekend mornings Solstice hosts a large breakfast buffet that is probably the best food bargain to be found in the restaurant. 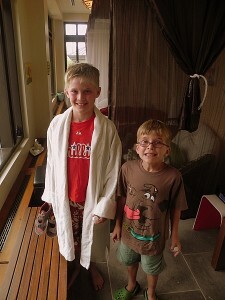 I’ll admit that it never occurred to me to sign up my boys for spa treatments. They’re boys. Their feet smell. And they don’t like to sit still. But Maggy Dunphy, the spa director is a passionate and persuasive advocate for making sure all visitors – regardless of age or gender – get a chance to relax. After talking to her and seeing the special room she created just for “Chillax” sessions that are designed for boys and girls alike, I decided we should give it a try. 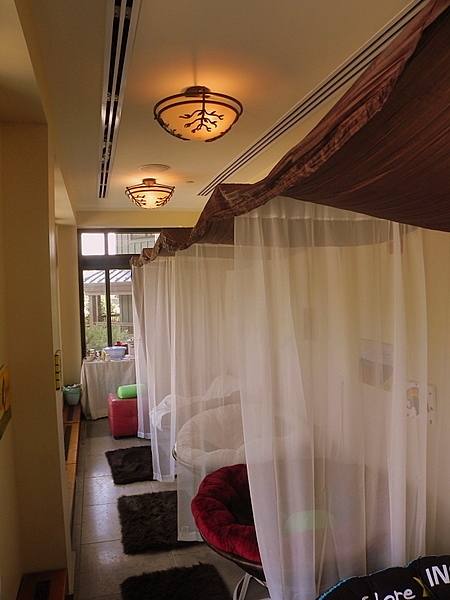 The sessions, which are 30 minutes long, cocoon children in massaging papa-san chairs while they enjoy hand and foot treatments including paraffin and whoopee pie lotion as well as lavender-scented washcloths and a chocolate facial. My boys were lucky enough to have the lovely and dynamic Maggy do the session with them. The verdict? 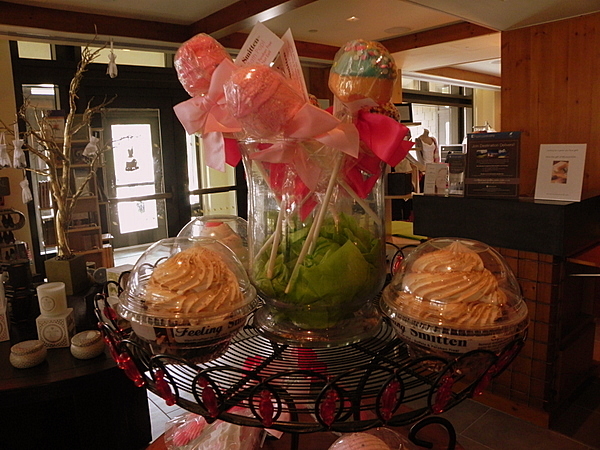 There are other treats aimed more at girls, like a Mini-Me facial and a Princess Manicure. The spa and salon offers an extensive, seasonally changing menu of services for adults as well, with everything from massages to skin treatments to manicures and pedicures. The focus is on relaxation and overall wellness. One affordable option that’s open not only to guests but the general public is the Friday Afternoon Club which includes a wine and cheese reception as well as hand and foot treatments for $20. 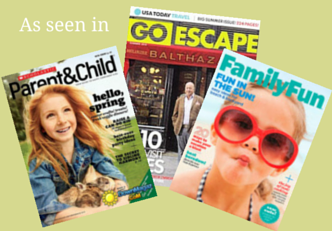 Sounds like the perfect way to unwind when you arrive for the weekend. No matter what season you visit, there are plenty of on-mountain activities to enjoy. I already wrote about how much we enjoyed the Alpine slide, climbing wall, and bungee trampoline. We also took the gondola up Mount Mansfield and enjoyed both the ride and the view. You can hike to the very top of Mount Mansfield from the gondola station, which is something we’ve vowed to return and do next summer. Our room overlooked the newly constructed performing arts center, which offers concerts and other performances throughout the year. 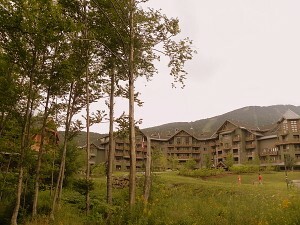 The surrounding area has many fun things to do as well: You can take a zipline canopy tour at Smuggler’s Notch; canoe, kayak, or swim in nearby rivers and streams; ride bikes, walk, or inline skate along a five-mile paved recreation path; mountain bike or cross country ski at Trapp Family Lodge; or check out the shops (including Laughing Moon Chocolates) and Ski Museum in Stowe village. The Ben & Jerry’s Factory, where you can take a tour, is not far away either. 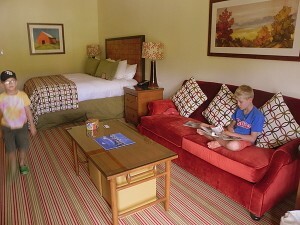 And frankly, the Lodge itself offers a great place just to relax and unwind. There’s a nice little playground, shuffleboard, and a giant outdoors chess set. We also spent an entire morning at the pool where the boys immediately made some new friends (including a little frog that we rescued and sent back into the surrounding nature). 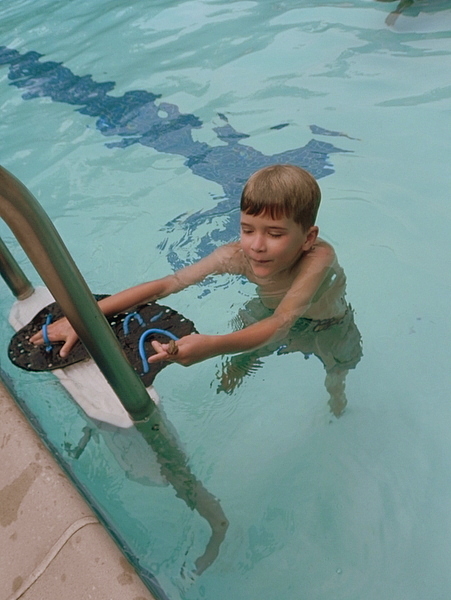 The pool is heated year-round, as are the stones around it. The boys were enchanted with the idea that if we stayed at the Lodge to ski they could swim outside in the winter (there’s a small entrance to the pool from the indoors). I preferred to think about snuggling up next to one of the fire pits on the pool deck with a hot beverage in hand. Another reason to return in the winter would be the downhill skiing. 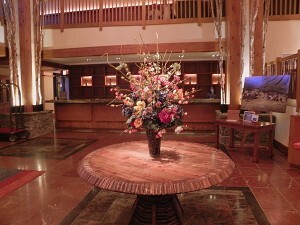 The Lodge is ski-in, ski-out, so you can arrive, park your car, and spend the rest of your vacation on the mountain. 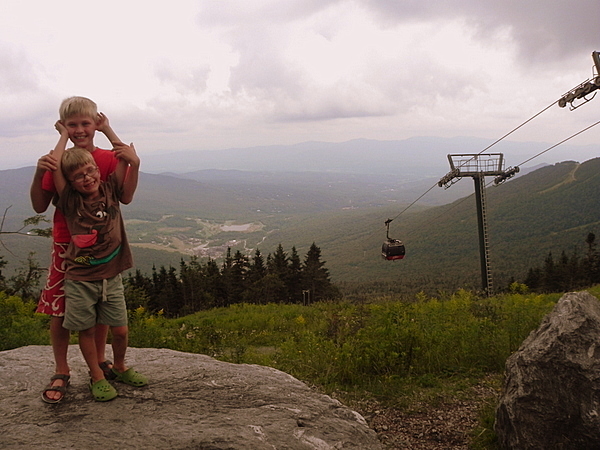 Mount Mansfield is right across the street – that gondola ride we took accommodates skis in the winter. There are 13 lifts and many miles of varied terrain. 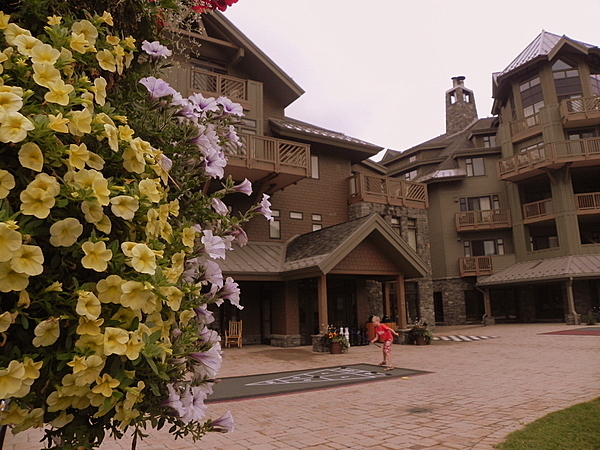 The resort offers all kinds of winter-time amenities including a ski-valet service that will deliver sharpened skis and warmed boots to you each morning. 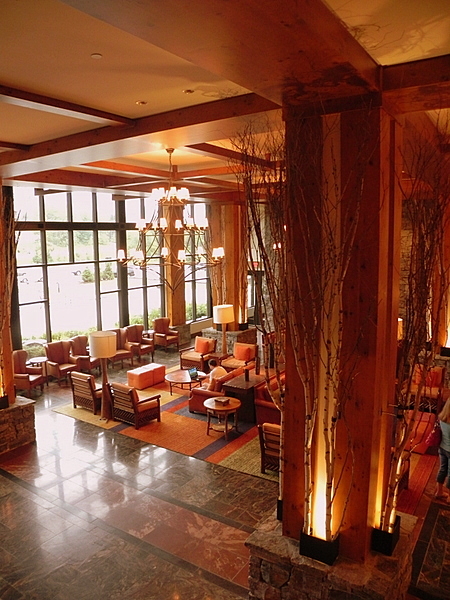 Stowe Mountain Lodge is by no means a cheap place to stay, but there are things you could do to make it more affordable. One thing I recommend is bringing your own beverages from coffee to wine. Looking at our food bill for the weekend, drinks added considerably to the total (we also had to wait nearly 40 minutes to have a couple of beers and juices delivered via room service). In addition, you could bring your own breakfast and lunch food and prepare these meals in your room using the well-stocked kitchen. On summer Fridays you can buy local produce to do this with at the onsite Farmers Market, which runs from the beginning of July through the first weekend in September. 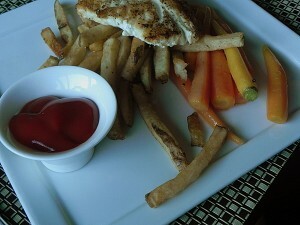 The town of Stowe also offers a wide selection of restaurants, many of which are great for families. In the winter the resort offers a shuttle bus that will take you down into town to explore them. 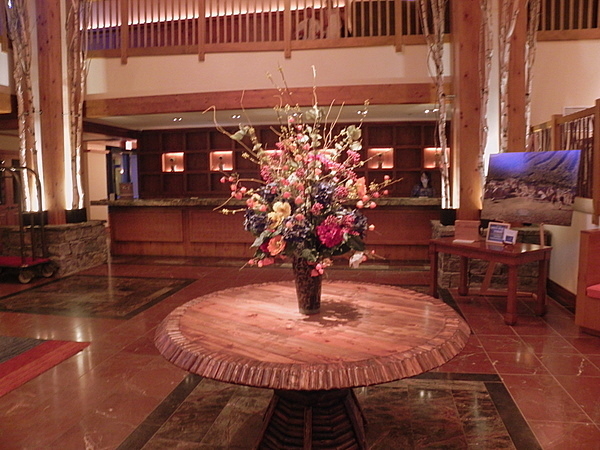 With such a high level of service and comfort and the quality of the accommodations and food, I’d say that Stowe Mountain Lodge is worth a splurge. Our stay at the Lodge came at the end of a busy three weeks during which we spent more time outdoors than in and were extremely active. All four of us loved having a weekend to unwind and be pampered, and Stowe Mountain Lodge was the perfect destination to do just that. Many thanks to Stowe Mountain Lodge and Destination Hotels and Resorts for covering the cost of our room, the boys’ spa treatments, and our on-mountain activities. As always, you can count on me to disclose when I receive something for free and also to share my honest opinions. Wow! 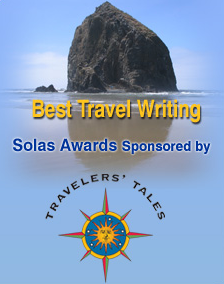 This is the ultimate of travel writing…you’ve made me want to head for Vermont right now! And I was devastated to see how much storm damage they sustained, so I’d be doing good for Vermont as well as for me. I think I would enjoy a chocolate facial too! This place looks wonderful.